The academic community sadly lost Caesar V. Mavratsas in 2017, prematurely, at the age of fifty-four. At the time of his passing, he was an associate professor at the University of Cyprus, in the department of Social and Political Sciences, in which, since his hire in 1995, he produced important work on Cypriot nationalism, a topic that preoccupied him both as a scholar and public intellectual. A dedicated teacher, Mavratsas was a staunch and often vigorous proponent of multicommunal coexistence as well as civil liberties on the island, and his interest in comparative ethnic studies, focusing on the Armenians and the Maronites of Cyprus, was lifelong. This essay focuses not on his more celebrated work on Cypriot nationalism, society, and politics but rather on Mavratsas’s academic work on Greek America, most of it produced prior to his return to Cyprus in 1995. However belatedly—for the occasion that motivates this tribute could not have been more unfortunate—my engagement here hopes to recognize Caesar Mavratsas as a significant early career sociologist of Greek America, and more specifically, to acknowledge him as a theoretically informed and empirically grounded scholar who contributes to our understanding of Greek immigrant entrepreneurship in the United States and the impact of this economic culture on the formation of a socioeconomically distinct Greek American identity, as well as to emphasize his pioneering contributions to transnational modern Greek studies and to comparative analysis of world Hellenisms. In this writing I concentrate on his early comparative research on Greek American sociology, published between 1993 and 1995, to foreground the manner in which he advanced Greek American studies and the questions that his work raises for this academic field down to our days. Given this professional trajectory it is not surprising that Mavratsas’s Greek American corpus is small: (1) a dissertation, entitled Ethnic Entrepreneurialism, Social Mobility, and Embourgeoisement. The Formation and Intergenerational Evolution of Greek-American Economic Culture (1993); (2) a book chapter, “Greek-American Economic Culture: The Intensification of Economic Life and a Parallel Process of Puritanization” (1995), which summarizes his dissertation findings; and (3) a journal article, “Cyprus, Greek America, and Greece: Comparative Issues in Rationalization, Embourgeoisement and the Modernization of Consciousness” (1995), which expands his comparative examination of Greek identity-making to include Cyprus. 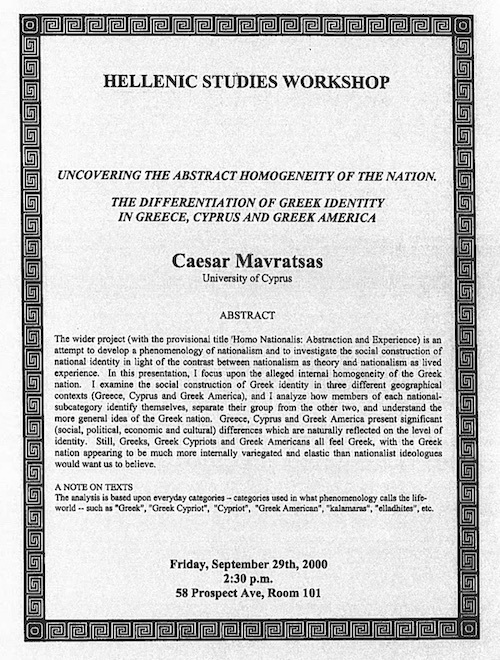 This interest resurfaced five years later, in his project as a visiting fellow in 2000 at the Seeger Center for Hellenic Studies, entitled, “Greek Identity in Greece, Cyprus and Greek America: From the Production to the Consumption of Nationalistic Ideology.” His talk at the center questioned the homogeneity that nationalism imposes on diverse Greek identities globally. Despite my efforts, I was not able to find evidence of any post-2000 publications or writings-on-file on this or any other Greek American topic. Though small, this corpus advances Greek American sociology considerably. His research carries great potential, prompting the “what if” question: what if he had kept his focus on Greek American topics longer? Would he have stayed with Greek American studies had this field possessed greater marketability? If the academic community is lesser because of his passing, Greek American studies is certainly lesser for his reprioritization of scholarly interests. But it is disheartening too that, to the best of my knowledge, no scholar has engaged at the ethnographic level with the questions he raised so pointedly. Neither do we have follow-up studies of interethnic, intraethnic and intradiaspora comparativism that Mavratsas pursued to various degrees (sometimes comprehensively, sometimes partially, and sometimes tentatively). Regardless, and unfortunately, his work has been gravely neglected among Greek Americanists, even by those who have immediate stakes in a topic he placed at the center of his interests, namely intergenerational upward mobility, a process often referred to as the embourgeoisement of Greek America. In this respect, it is curious that his work is absent from the bibliography of the latest, 2014 updated edition of Charles Moskos’s Greek Americans: Struggle and Success, a book that as early as 1982 pioneered and subsequently popularized the embourgeoisement concept, making it a household name in Greek America. This commemorative essay seeks to correct this all-around neglect. My aim in this writing is twofold: (1) to identify Mavratsas’s major contributions to Greek American studies and to note the potential of his work for future research; and in the interest of promoting further conversation (2) to engage with aspects of it, specifically regarding a sociologist’s responsibility vis-à-vis the worldviews of the people he studies. This angle, regarding a sociologist’s responsibility, might be seen as inappropriate, in fact misplaced, in a piece honoring this scholar posthumously. I have nevertheless decided to include it, respectfully, and with the understanding that I am discussing an early career corpus. I exercise particular caution not to critique Mavratsas from the vantage point of contemporary scholarship or paradigms he did not practice. Instead, I place my critical analysis within the theoretical axioms of the sociology that he did practice, namely Max Weber’s value-free sociology and Peter Berger’s sociology of knowledge. In other words, I identify questions that his work did not probe though they were legitimate within his working paradigm. Two reasons inform my decision for this critical evaluation: the high political stakes involved in explaining Greek American socioeconomic mobility; and Mavratsas’s own scholarly ethos. He was one of those educators who welcomed challenges and disagreements, his agonistic spirit making him popular with students.1 Unfortunately, he is not among us to enter the conversation and cherish the debate. Engaging with his work renders it visible, and promotes dialogue around his life’s work on Greek America. There is a personal motivation, too, in my intention to initiate this reflection, one that compensates for a missed opportunity for an interpersonal exchange with Mavratsas, in the 1990s. He and I attended the same conference three times—consecutive Modern Greek Studies Association symposia—in 1995 (Harvard University), 1997 (Ken State University), and 1999 (Princeton University). In 1999, in fact, we were part of the same panel, “Ethnic Identity” (chaired by the late Adamantia Pollis), where he presented the paper “From the Production to the Consumption of Nationalist Ideology: Greek Identity in Different Contexts–Greece, Cyprus, and Greek America,” consistent with his project at the time, as I mentioned, at Princeton University. For reasons that are unclear to me, we did not seek each other out. I was a graduate student in the mid 1990s and received my PhD in 1999. I had read his work and valued it for its insights and potential, though I had strong reservations about his adherence to the Weberian notion of value-free sociology when his findings were so politically charged. This was a disagreement over the task of a scholar. Mavratsas did not see it as part of a scholar’s responsibility to critically probe his interviewee’s explanations of their upward mobility solely in terms of individual effort, while from my part I did, a concern that figured centrally in my own subsequent work. If one of the purposes of conferences is to foster critical debate, both formally and informally, I certainly failed to engage person-to-person with a colleague whom I respected but with whom I disagreed, an oversight which, in retrospect, I very much regret. This belated engagement, well-intentioned though agonistic—necessarily so as I explained—is of course a monologue in what ideally should had been a dialogue. In defense of this one-sidedness I can only claim the purpose of this essay as a forum for a renewed social sciences exchange around the questions Mavratsas so astutely raised. Born in Cyprus, Mavratsas received a Fulbright scholarship and studied sociology and philosophy at Boston University, where he received a BA in 1986. He subsequently pursued a PhD at the same institution, on a second Fulbright, graduating in 1993. His affiliation with the Institute for the Study of Economic Culture (ISEC), a research center, had a formative effect both on the choice of his dissertation topic, theoretical approach, and angle of analysis. The ISEC asserted the importance of investigating the role of culture (beliefs, values, predispositions) in the study of economic behavior, and, in turn, promoted empirical research to explore such linkages. Studying immigrant small businesses was a vital component of this project, and such inquiry about ethnic entrepreneurialism was undertaken comparatively, in the interest of understanding variations in the entrepreneurial orientation among various immigrant groups as well as the corresponding differentiation in rates of mobility. There was interest in the applied prospects of this research too, as identifying successful case studies could foster programs promoting self-employment in low-income communities. Success in small business initiatives carried value for economic development, and, in turn, guided research questions. Peter Berger, a noted sociologist and the major advisor in Mavratsas’s dissertation, was instrumental in shaping the research direction of the ISEC. His “economic culture approach” interlinked the study of culture, economy, and politics. It probed the investigation of “‘the social, political, and cultural matrix’ within which economic conduct and values are embedded,” crucially shaping Mavratsas’s project.4 In what ways, the latter asked, do Greek political culture and economic values and behavior interconnect? And how do the economic values immigrants import intersect with the American economy, shaping adaptation in the host country? These questions sparked the comparison among politics, culture, and economy initially between Greek America and Greece, and later Cyprus. Mavratsas investigated the Greek American case empirically, through a series of interviews undertaken between 1989 and 1991 in the greater Boston area. His goal was to understand a social type, the Greek immigrant entrepreneur. He worked within the Weberian tradition of ideal types. “[N]either monolithic nor static,” ideal types “point to the existence of persistently enduring empirical tendencies and sociological regularities.”5 Weber’s sociology and Berger’s sociology of knowledge anchored his practice in empirically eliciting the social actor’s subjective meanings—an individual’s knowing, valuing, and acting upon life—and then analyzing the manner by which this knowledge comes about. Mavratsas practiced “interpretive-humanistic sociology,” centering attention to how meaning informs human action, shaping, and giving rise to social realities. The analysis of the interviews foregrounds an individual’s point of view, what an individual knows about and how he understands his reality, casting light on several important questions: Why does the typical Greek entrepreneur place work at the center of his economic and moral life? How does he—the research explicitly focused on male economic culture—understand the reasons for his socioeconomic mobility? What is meaningful in life and how is this meaning expressed? How does the immigration experience contribute toward the making of a Greek American identity, distinct from a Greek one? How does the immigrant understand American society? A set of questions follows from this: how to explain the phenomenon of rural peasants rapidly turning into the petit bourgeois, and their offspring into white collar professionals? Sociologists have offered insights, pointing to the immigrants’ previous market skills in Greece and their work ethic as causes for the immigrant transition. Parallels were drawn between the Greek immigrant and the Calvinist work ethic.12 But no comprehensive theoretical model was developed to explain the interrelationship between (1) the adaptation of former peasant Greek immigrants to small business owners; (2) the resulting formation of a distinct Greek American identity and its associated differentiation from a Greek identity; and (3) the occupational transformation across generations from immigrant entrepreneurs to white collar professionals. Mavratsas injected Greek American sociology with theoretical rigor, reflecting on his epistemology, being explicit about his methodological assumptions and limitations, and, ultimately, proposing a powerful explanatory schema. The broad contours of his model are as follows: under immense pressure to make it economically—the primary motivation for emigrating in the first place—immigrants mobilized their transplanted cultural endowment, which proved adaptive to the context of American capitalism. The decision to achieve faster mobility by way of self-employment, preferred over wage labor, was facilitated by available ethnic and kinship networks already practicing entrepreneurialism and offering opportunities for apprenticeship. The middleman minority adaptation crucially shaped their petit bourgeois cultural and political outlook, which, in turn, contributed toward a distinct Greek American identity, a hybrid identity, neither totally Greek nor wholly American. Mavratsas built on this value-centered rationality to identify and explain the formation of a sui generis Greek American immigrant identity. Unlike in Greece, he noted, the immigrant lacks the option of entering into clientelist relations with the State, a condition that directs him to “pursue the welfare of his family exclusively through economic,” not political means.21 Coupled with the moral imperative of success and his social marginalization, the immigrant entrepreneur, as a social and economic type, cultivates an intense work ethic, his “role as an economic actor acquir[ing] increasing importance in the development of his identity and self-understanding. It becomes the paramount mode of his existence.”22 This “economic intensification,” as Mavratsas calls it, parallels a process of puritanization, the development that is of a world view defined by social and political conservatism; an ethos “suspicious of both social democratic ideals and working-class orientation,”23 and “non-sympathetic to the interventionist state”;24 adherence to family and church life; and an orientation marked with “a more ascetic life-style with less emphasis on literary and artistic pursuits,”25 coupled with a “certain anti-intellectualism,” and aversion to bohemian lifestyles.26 This experience gives rise to a hybrid culture, Mavratsas suggests, combining the immigrant petit bourgeois culture with American belief in opportunity and prioritizing individual responsibility as the means for mobility. Embodying this ethos, the immigrants “think of and understand themselves primarily in contrast and comparison to mainland Greeks.”27 He differentiates himself from the political culture of clientelism in Greece, seeing himself as “a better worker” (καλύτερος δουλευτής), who keeps a safe distance from the overpoliticization and hedonism of Greek culture. An interviewee marked a strong boundary between himself, a Greek American, and Greeks: he “really detest[s] the Greeks” particularly when he visits the country.28 The conditions of migration and personal experience validate this taken-for-granted knowledge. Mavratsas’s sociology works with Weberian ideal types. It comes as no surprise, therefore, that the findings are presented through the point of view of a fictitious male persona, Costas, whom Mavratsas constructs on the basis of the sum total of his interviews to represent a typical immigrant who turned into a relatively successful restauranteur. A poor farmer in southern Greece who immigrated in 1965, and joined his maternal uncle, this figure had little formal education. He did not mind working menial and “undignified” jobs, lived a frugal life, and saw the pizza business as the most practical route to mobility, a business about which he learned through a two-year apprenticeship in the business of a coethnic. Costas valued his business as an enterprise on which he exercised direct control, allowing an independence from outsiders whom he deeply distrusted, and offered opportunities for interpersonal interaction with customers and employees. His ethos contrasted with the “formal rationality” that frames work in an “impersonal and formalistic manner”29 to opt for a “personalistic-familistic” character, the norm among Greek American small businessmen. Costas took pride in his “managerial and entrepreneurial spirit,”30 and in his sacrificing for his children, fulfilling his moral obligation as a good provider—being in a position to finance a college education for all his three children, including the eldest whom he dissuaded from studying psychology to study law at a “very expensive” private university. His daughter “agreed to attend college only when her father promised her a nice new car at the end of her sophomore year.”31 Church, family, and his business constitute the center of his life. He has “developed a Greek-American identity,” “he is not simply Greek nor totally American.” He attributes Greece’s problems to “people there … not willing to work hard,” and “votes Republican because he hates to see taxes being spent on social welfare.” This character self-identifies as a conservative who believes that there is equal opportunity for everyone in America. “Only those who do not have the drive, stay behind. ‘Δουλεύουμε εμείς για να τρώνε άλλοι,’ do we work for the others to eat?” he maintains.32 From his vantage point, poverty or homelessness is a phenomenon largely because of individual unwillingness to work. This is the knowledge that Costas brought to his understanding of American society. This figure, then, represents a type within a pattern, the petit bourgeois ethos of Greek immigrant entrepreneurs whose family orientation, work ethic, and conservatism are elevated and placed at the heart of his existence, attaching meaning to his life. He sublimates work, since “financial success becomes an ethical imperative,” associated with an “ascetic life-style in an almost heroic mode.” It is part of the struggle, “a manifestation of the agonistic spirit and toughness necessary for succeeding in life.”33 The petit-bourgeois ethnic entrepreneur develops a strong sense of individual responsibility, directing his resources toward family and the preservation of ethnic community. Mavratsas repeatedly reminded his readers that Greek America is not a monolithic entity. Working with social types he focused on a powerful pattern, the professional trajectory from peasant into petit bourgeois entrepreneur and eventually the middle-class white collar professional. This has been a trajectory described by Charles Moskos as embourgeoisement, a broad and problematic term,34 and a process of mobility that finds statistical validation in the oft-quoted census fact of Greek Americans being the highest educated American ethnic group and the second highest in economic attainment. The lack of specificity in the term served Mavratsas’s typological orientation well. It fit with linking the cultural capital of family honor—sacrificing parents for the mobility of the children—and “competitive individualistic familism,”—the simultaneous, agonistic coexistence between intense familism and intense individualism—promoting the socioeconomic advancement of the offspring through college education.35 It is this pattern, Mavratsas argued, that captured the increasing modernization of Greek America, from the personalistic rationality of the immigrant entrepreneur to the logical formality of the American-born professional. Unequivocally, Mavratsas declared universal validity to his specific ethnographic case.39. Though his claim may apply to his occupational and regional sample, there is no clear indication that his research probed the perspectives of those immigrants subsisting under the poverty level, nor those of students, professionals, and those who may have reasons to be hiding leftist sympathies. Seen from today’s perspective, the answer to the debate is not as clear cut. The current national and ethnic importance assigned to Greek American labor organizer Louis Tikas, murdered during the infamous labor strike at Ludlow, Colorado, in 1914, cautions against readily dismissing the contemporary value of working class activism in the past. Research on the question must cast its net wider and deeper within the archive but also acknowledge regional specificities in its design. Greek Americans in the states of Utah, Colorado, and New Mexico, for instance, have radically different collective and family histories, memories, and experiences than post-1960s immigrant entrepreneurs. Bringing together culture, economy, and politics, the encounter between European immigrants and the American society entails precisely the constellation of relations that were at the center of Mavratsas’s research project. When it comes to the relations between immigrant cultural endowment and ethnic entrepreneurship, Mavratsas’s analysis represents a textbook example in the sociological understanding of the petit bourgeois construction of reality. But when it comes to the immigrants’ knowledge of American society, his analysis neglects to probe a guiding principle in practicing sociology of knowledge, namely the concern with “the relationship between human thought and the social context within which it arises.”50 Though aptly placing immigrants in their Greek context, his work neglects to place the immigrants within an all-important American political context that circulated widely and validated decisively the bootstrap version of upward mobility. It bracketed off the operation of formal and informal structures working in favor of European immigrants—classified as white ethnics at the time—while hindering labor market opportunities among people of color. 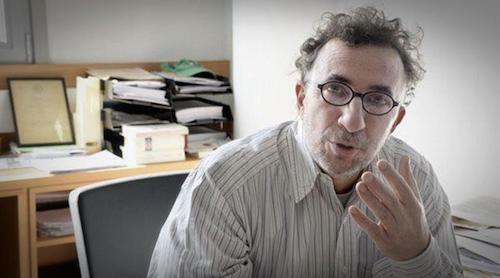 Understandably, Mavratsas produced his work at a moment prior to the wide circulation of whiteness studies, an academic field that brought sharper analytical attention to how the racial positioning of individuals, including immigrants, within the social structure affects social and economic experience. In the context of his study, then, the question presented itself: did Greek immigrants possess a competitive racial advantage vis-à-vis people of color in the economic landscape, racially charged as we will see, of the wider Boston region? In the American south, where the institutionalized racism of Jim Crow legally ended only in 1964, with the passage of the Civil Rights Act, white ethnics unequivocally possessed a racial privilege over African Americans—treated as second class citizens—a fact that points to region as an important analytical category in ethnic entrepreneurial studies. But in Boston? A book chapter in New Migrants in the Marketplace, the same book where Mavratsas published his findings, provided empirical evidence to register the operation of racism against immigrants from the West Indies within the regional labor market.51 It follows that the folk statements positing hard work as the sole route to mobility, and in turn generating feelings of ethnic superiority, were missing the impact of racism on differential mobility. The ethnic entrepreneur turns into a national folk hero precisely because this figure encapsulates an idea entrenched in American political life, that of self-reliance, individualism, and hard work, and, in doing so, deflects attention from structures of oppression. This bootstrap model became a politically inflected narrative in the post-civil rights “culture wars” over the nature of American multiculturalism. Since the early 1960s, if not earlier, conservative renderings, highly visible at the academic, intellectual and party politics level, elevated “the immigrant success story” as the prototype of ‘the American experience,’” the “bootstrap self-help” serving as evidence of “the impropriety of state intervention in correcting for the injustices of racial stratification.” European immigrants were posited as “the exemplars of this ‘central tendency in American history’–its openness, [and] its premium on a diversity of participants.”58 Not surprisingly, the ideal social type in Mavratsas’s study votes republican and staunchly opposes welfare. In reflecting on the social construction of reality, Mavratsas aptly noted that human subjects are neither isolated entities, nor, as I mentioned, always knowledgeable sociological theorists. They are being shaped by their surrounding milieu, and not always in a position to make correlations among realities not immediately connected with their own personal experience.59 It is the responsibility of the sociologist, according to the sociology of knowledge, to correlate concepts and connect subjective meaning with wider social phenomena. An ethnographic fact that Mavratsas reported, albeit in a footnote, provides a point of departure for reflecting on the task of sociology as he saw it. Such ethnographic evidence underlines a political transition, a trend toward conservativism. How does one make sense of this reorientation? The immigrants cite experience-based knowledge to justify it, an understanding that the sociologist registers and describes as a social fact. To recall Peter Berger, however, the sociology of knowledge requires analysis of the social processes through which “a taken-for-granted ‘reality’ congeals for the man in the street.” To build on this mandate I turn to Matthew Frye Jacobson who demonstrates the powerful resonance in the 1980s between “street sensibilities” among white ethnics, the scholarship of immigrant bootstrap, and the discourse of the Republican party. The power of populist conservatism, ubiquitous at the time in academic, media, and popular writings, cannot be absent from investigating the major political shifts occurring among white ethnics, including Boston in the Northeast. As Jacobson notes, Black struggles for equality, recognition of and reparation for past injustices directed “disgruntled white ethnics, largely of the Northeast and Midwest,” toward the Republican party. They “joined Nixon’s ‘silent majority’ in 1968” and “became known as “Reagan Democrats in the 1980s.”61 Notably, the appeal of “the segregationist George Wallace ‘to ethnic voters in the urban Northeast’”62 cannot be understood independently from people of color interrogating the state as responsible for historical patterns of injustices and demanding structural changes. It is this larger, racially charged political landscape, that helps us understand the resonance between the conservative argument and “street-level discussion among white ethnics.”63 White ethnics were turning toward conservatism not necessarily because of “minorities’” alleged abuse of welfare but because conservative ideology served white ethnic interests. As anthropologist Karen Brodkin notes, the stigmatization of African Americans and immigrants from Central America “as lazy welfare cheats encourage[s] feelings of white entitlement to middle-class privilege.”64 Far from being a neutral ethnographic fact, immigrant conservatism was steeped in powerful discourses safeguarding self-serving social and economic privileges within a system of racialized hierarchies. Immigrant knowledge was mediated by the ideology of the corrupt, not deserving, minority poor. It was culture, not structure, that determined adaptation. While Greek immigrant culture offered a transnational asset, Mexican and African American culture worked as liability, being the leading cause for poverty among the latter according to the infamous 1959 “culture of poverty” thesis.65 The Greek entrepreneur assimilated into an enduring national ideology, one shifting attention from considering the constitute role of socioeconomic conditions on lack of mobility, instead blaming the poor themselves. Graduate students are shaped, consciously and unconsciously, by the work of their advisors as dissertations are produced in contexts where PhD candidates navigate power relations within the academy. Few students, if any, can claim absolute autonomy when it comes to their place within this web of unequal relations. It will be unfair therefore to critique any early career work for being shaped by the intellectual presence of the principal supervisor. I would like to register here a particular commonality between Peter Berger, the mentor, and Caesar Mavratsas, the budding scholar, namely the importance they both assigned to strong civil society. This is not to suggest, however, that they arrived to this valuation via identical intellectual and political routes. In fact, Berger advocated civil society as a mechanism of resource redistribution in American society, while Mavratsas discussed its relative importance as a function of political and economic culture, in the comparative context of Greece, Cyprus, and Greek America. Unfortunately, the linkages that Greek Americans drew between their community institutions and the national ideology of self-help remained outside the purview of his work. Mavratsas’s contributions have been multiple. Within a single dissertation, he advanced Greek American studies in several fronts, including (1) transnational scholarship; (2) comparative ethnic studies—primarily comparative work between Greek America and Greece; and (3) theoretically informed analysis, all pioneering scholarly contributions. What’s more is that he illustrated ethnicity as social production, a process of identification that takes place at various intersections of cultural values, class, and gender within specific contexts in the host society. Ethnic identity in this formulation is a dynamic process entailing negotiation, adaptation, transformation, and differentiation. Sociologists speak about this process as ethnogenesis, a notion which aptly moves away from the conventional view of ethnicity as loss or attenuation of cultural traits (language, behaviors and values) moving instead toward the understanding of ethnicity as a social process in-the-making: the production of new identities and cultural arrangements (syncretic, assemblages, reconfigurations) within concrete sociopolitical contexts. The analytical power of approaching ethnic identity as social production lies in its capacity to explain internal heterogeneity within a particular ethnic group as various identities (class, gender, cultural, sexual) negotiate the same environment differently, and individuals sharing similar subject positions negotiate different environments (rural vs. urban, regional vs. national) differently. What is the value of Greek American studies? This is an issue that academics working on immigration and ethnicity are prone to raise, often in a questioning mode. Mavratsas’s work offers a productive answer. His focus on the particularities of the Greek immigrant adaptation necessitated a transnational framework of analysis, establishing the necessity of understanding Greek immigrants both in relation to the “cultural endowment” of their historical homeland and their specific adaptations in the host society. Both contexts must be considered in relation to each other. This framing implicitly legitimizes the academic value of Greek American studies. Ethnic studies in the United Stated has had already established the necessity for a culturally specific examination of immigrant peasants. As early as 1964, for instance, Rudolf Vecoli, writing as an Italian American studies scholar, made the case that Italian immigrants “could not be understood through a general study of the European immigration,” thus confronting Oscar Handlin’s homogenizing and widely held notion of a universal “European peasant village.”74 Ethnographic comparative studies across European immigrants and ethnicities present the next promising research frontier. Since the mid-1990s, Greek American sociology and ethnography have been largely impoverished academic fields, the few bright scholarly exceptions illuminating the dramatic dearth of a wide, in-depth and sophisticated corpus. In the case of Mavratsas, Greek American studies lost an exceptionally promising early career scholar. Unfortunately, as I mentioned, no Greek Americanist has engaged with the scholarship he bequeathed us, particularly his comparative work, and his bringing the political, the economic, and the cultural into conversation. Will there be interest toward this direction? Given the few active scholars in the field a pragmatic answer could range from dejected pessimism to the agnosticism of “there is no way to tell.” While Greek American studies keeps losing exceptional junior scholars to other fields, it is gaining, often unexpectedly, through the infusion of new scholarly talent. There is the guarded possibility that perhaps a new generation or established scholars in sociology, cultural anthropology, and political science might be building on Mavratsas’s work, developing it in various directions. Mavratsas was aware that working with the notion of the ideal type circumscribes one’s work. In fact, it has no merit after the work of Alfred Schutz, after Chicago School of Sociology, after Symbolic Interactionism and after Ethnomethodology. The category “typical ethnic entrepreneur” is limited and limiting. Obviously, it is not raising questions neither about failed entrepreneurs nor immigrant working class poverty. It is not probing diversity of world views within small business owners. It is not concerned about women’s views or intrafamily negotiations, even conflict, about what constitutes success in life. It is not addressing the phenomenon of nuclear families entering business with kin, a situation not disconnected with family fallouts and failures. It is not in a position to account for those cases where an entrepreneur did not sublimate work, displaying no sacrifice for the offspring. What is more, while the transmission of the petit bourgeois view of bootstrap mobility has been powerfully reproduced by the American born-middle class, both at the level of the ethnic community and at a national scale, there is also the question of agency among those Greek Americans who have been confronting their parents’ conservatism. It has also been noted that the embourgeoisement framework does not acknowledge the fact that several white collar professionals such as educators are experiencing relative downward mobility compared to that of their immigrant parents and grandparents.75 It is up to the sociologists and ethnographers of the future to explore the diversity, contradictions, and variations of Greek America, and in doing so expand the understanding of small business owners and the “second generation” beyond typologies. Such a development, I believe, would have been gratifying to Mavratsas, aligned with his investment to advance Greek American sociology. I thank Dušan Bjelić, Vangelis Calotychos, and Despina Lalaki for their useful insights. 2. Caesar Mavratsas, “Greek-American Economic Culture: The Intensification of Economic Life and a Parallel Process of Puritanization,” in New Migrants in the Marketplace: Boston’s Ethnic Entrepreneurs, ed. Marilyn Halter (Amherst: University of Massachusetts, 1995), 117, fn.3. 3. Marilyn Halter, “Introduction–Boston’s Immigrants Revisited: The Economic Culture of Ethnic Enterprise,” in New Migrants in the Marketplace: Boston’s Ethnic Entrepreneurs, ed. Marilyn Halter (Amherst: University of Massachusetts, 1995). 4. Caesar V. Mavratsas, “Greece, Cyprus and Greek America: Comparative Issues in Rationalization, Embourgeoisement, and the Modernization of Consciousness,” Modern Greek Studies Yearbook 10/11 (1994/1995): 141. 6. Caesar V. Mavratsas, Ethnic Entrepreneurialism, Social Mobility, and Embourgeoisement. The Formation and Intergenerational Evolution of Greek-American Economic Culture (PhD diss., Boston University, 1993), 98. 8. Mavratsas, “Greek-American Economic Culture,” 98. 9. Mavratsas, Ethnic Entrepreneurialism, Social Mobility, and Embourgeoisement, 97. 10. Yorgos Kourvetaris, “Greek American Professionals and Entrepreneurs,” Journal of the Hellenic Diaspora, Special Quadruple Issue, The Greek American Experience XVI, nos. 1–4 (1989): 109. 11. Charles C. Moskos, Greek Americans: Struggle and Success, 2nd ed. (New Brunswick: Transaction Publishers, 1989), 139. 12. George Christakis, for instance, in an unpublished lecture (Chicago, Illinois, 1988). In Kourvetaris, 112. 13. Mavratsas, Ethnic Entrepreneurialism, Social Mobility, and Embourgeoisement, 210. 15. Mavratsas, “Greek-American Economic Culture,” 98–99. 16. Mavratsas, Ethnic Entrepreneurialism, Social Mobility, and Embourgeoisement, 142. 19. Mavratsas, “Greece, Cyprus and Greek America,” 160. 20. Mavratsas, Ethnic Entrepreneurialism, Social Mobility, and Embourgeoisement, 250. 21. Mavratsas, “Greece, Cyprus and Greek America,” 159. 22. Mavratsas, “Greek-American Economic Culture,” 106. 23. Mavratsas, “Greece, Cyprus and Greek America,” 151–52. 24. Mavratsas, Ethnic Entrepreneurialism, Social Mobility, and Embourgeoisement, 110. 26. Mavratsas, “Greek-American Economic Culture,” 113. 27. Mavratsas, Ethnic Entrepreneurialism, Social Mobility, and Embourgeoisement, 98. 29. Mavratsas, “Greek-American Economic Culture,” 103. 30. Mavratsas, Ethnic Entrepreneurialism, Social Mobility, and Embourgeoisement, 274. 34. Dan Georgakas, “Response to Charles C. Moskos,” Journal of the Hellenic Diaspora XIV, nos. 1&2 (Spring–Summer 1987). 35. Mavratsas, Ethnic Entrepreneurialism, Social Mobility, and Embourgeoisement, 144. 36. Alexander Kitroeff, “The Moskos–Georgakas Debate: A Rejoinder,” Journal of the Hellenic Diaspora XIV nos. 1&2 (Spring–Summer 1987). 37. Mavratsas, Ethnic Entrepreneurialism, Social Mobility, and Embourgeoisement, 311. 39. Mavratsas noted that in Massachusetts, the “overwhelming majority of Greek Americans with electoral positions belong to the liberal faction of the Democratic Party,” a fact that he saw as a paradox given the “conservative milieu from which they originate.” It was not ideology that steered the aspiring politicians, he proposed, but a decision “reflecting the adaptability and pragmatic qualities of the Greek-American ethos.” With no “Greek American voting block” in the state, American-born politicians gravitate toward the Democratic party because of its regional dominance, which maximizes their “chances of [political] success.” But contrary to the tenets of humanistic sociology, Mavratsas did not seek the subjective meanings these politicians attached to their profession. Mavratsas, Ethnic Entrepreneurialism, Social Mobility, and Embourgeoisement, 329–31. 40. Berger Peter, “Foreword,” in New Migrants in the Marketplace: Boston’s Ethnic Entrepreneurs, ed. Marilyn Halter (Amherst: University of Massachusetts, 1995), viii. 43. Yiorgos Anagnostou, “White Ethnicity: A Reappraisal,” Italian American Review 3.2 (Summer 2013): 105–106. 44. Mavratsas, Ethnic Entrepreneurialism, Social Mobility, and Embourgeoisement, 310­–12. 46. Alvin W. Gouldner, “Anti-Minotaur: The Myth of a Value Free Sociology,” Social Problems 9.3 (1962): 200. 47. Mavratsas, “Greece, Cyprus and Greek America,” 164. 48. Mavratsas, Ethnic Entrepreneurialism, Social Mobility, and Embourgeoisement, 22–23. 49. Peter L. Berger and Thomas Luckmann, The Social Construction of Reality: A Treatise in the Sociology of Knowledge (Garden City, N.Y.: Doubleday & Company, 1966), 3. 51. Violet Johnson, “Culture, Economic Stability, and Entrepreneurship: The Case of British West Indians in Boston,” in New Migrants in the Marketplace: Boston’s Ethnic Entrepreneurs, ed. Marilyn Halter (Amherst: University of Massachusetts, 1995). 52. Mavratsas, Ethnic Entrepreneurialism, Social Mobility, and Embourgeoisement, 310. 53. Mavratsas, “Greece, Cyprus and Greek America,” 157. 54. Mavratsas, Ethnic Entrepreneurialism, Social Mobility, and Embourgeoisement, 310. 55. Nathan Glazer and Daniel Patrick Moynihan, Beyond the Melting Pot: The Negroes, Puerto Ricans, Jews, Italians, and Irish of New York City (Cambridge, MA: M.I.T. Press, 1963). 58. Matthew Frye Jacobson, Roots Too: White Ethnic Revival in Post-Civil Rights America. (Cambridge, MA: Harvard University Press, 2006), 181, 196. 59. Mavratsas, Ethnic Entrepreneurialism, Social Mobility, and Embourgeoisement, 23. 60. Ibid., 438, fn. 42. 64. Karen Brodkin, How Jews Became White Folks and What That Says about Race in America (New Brunswick, NJ: Rutgers University Press, 1998), 52. 65. Oscar Lewis, Five Families: Mexican Case Studies in the Culture of Poverty. (New York: Basic Books, 1959). 66. See, for instance, the documentary The Greek Americans, directed by George Veras (Veras Communications Inc., 1998). 67. The term neoconservative “applies broadly to a prominent group of intellectuals who, once considered to be on the left, are now on the right,” and who, unlike liberals, thought that society is difficult to change, and, unlike conservatives, accepted the “welfare state though not in its present incarnation.” Mark Gerson, ed., “Introduction” in The Essential Neoconservative Reader, foreword by James Q. Wilson (Reading, MA: Addison-Wesley Publishing Company, Inc., 1996), xiii, xiv. 69. Peter Berger and Richard John Neuhaus, To Empower People: From State to Civil Society. (Washington, D.C.: American Enterprise Institute, 1977). 70. James Q. Wilson, “Foreword,” in The Essential Neoconservative Reader, ed. Mark Gerson (Reading, MA: Addison-Wesley Publishing Company, Inc., 1996), ix. 72. Mavratsas, “Greece, Cyprus and Greek America,” 159. 74. Gerald Meyer, “Theorizing Italian American History: The Search for an Historiographical Paradigm,” inThe Status of Interpretation in Italian American Studies, ed. Jerome Krase (Stony Brook, NY: Forum Italicum Publishing, 2011), 164, 165. Anagnostou, Yiorgos. “White Ethnicity: A Reappraisal.” Italian American Review 3.2 (Summer 2013): 99–128. Berger, Peter. “Foreword.” In New Migrants in the Marketplace: Boston’s Ethnic Entrepreneurs, edited by Marilyn Halter, vii–ix. Amherst: University of Massachusetts, 1995. Berger, Peter, and Richard John Neuhaus. To Empower People: From State to Civil Society. Washington, D.C.: American Enterprise Institute, 1977. Berger, L. Peter, and Thomas Luckmann. The Social Construction of Reality: A Treatise in the Sociology of Knowledge . Garden City, NY: Doubleday & Company, 1966. Brodkin, Karen. How Jews Became White Folks and What That Says about Race in America . New Brunswick, NJ: Rutgers University Press, 1998. Georgakas, Dan. “Response to Charles C. Moskos.” Journal of the Hellenic Diaspora XIV nos. 1&2 (Spring–Summer 1987): 63–72. Gerson, Mark, ed. “Introduction.” In The Essential Neoconservative Reader, foreword by James Q. Wilson, xiii-xvii. Reading, Mass. : Addison-Wesley Publishing Company, Inc. 1996. Glazer, Nathan, and Daniel Patrick Moynihan. Beyond the Melting Pot: The Negroes, Puerto Ricans, Jews, Italians, and Irish of New York City . Cambridge, MA: M.I.T. Press, 1963. Gouldner, Alvin W. “Anti-Minotaur: The Myth of a Value Free Sociology. Social Problems 9, no. 3 (1962): 199–213. Halter, Marilyn. “Introduction–Boston’s Immigrants Revisited: The Economic Culture of Ethnic Enterprise.” In New Migrants in the Marketplace: Boston’s Ethnic Entrepreneurs, edited by Marilyn Halter, 1–22. Amherst: University of Massachusetts, 1995. Jacobson, Matthew Frye. Roots Too: White Ethnic Revival in Post-Civil Rights America. Cambridge, MA: Harvard University Press, 2006. Johnson, Violet. “Culture, Economic Stability, and Entrepreneurship: The Case of British West Indians in Boston.” In New Migrants in the Marketplace: Boston’s Ethnic Entrepreneurs, edited by Marilyn Halter, 59–80. Amherst: University of Massachusetts, 1995. Kitroeff, Alexander. “The Moskos–Georgakas Debate: A Rejoinder.” Journal of the Hellenic Diaspora XIV nos. 1&2 (Spring–Summer 1987): 73–78. Kourvetaris, Yorgos A. “Greek American Professionals and Entrepreneurs.” Journal of the Hellenic Diaspora. Special Quadruple Issue, The Greek American Experience XVI, nos. 1–4 (1989): 105–128. Oscar, Lewis. Five Families: Mexican Case Studies in the Culture of Poverty. New York: Basic Books, 1959. Mavratsas, Caesar V. Ethnic Entrepreneurialism, Social Mobility, and Embourgeoisement. The Formation and Intergenerational Evolution of Greek-American Economic Culture . PhD diss., Boston University, 1993. Mavratsas, Caesar. “Greece, Cyprus and Greek America: Comparative Issues in Rationalization, Embourgeoisement, and the Modernization of Consciousness.” Modern Greek Studies Yearbook 10/11 (1994/95): 139–69. Mavratsas, Caesar V. “Greek-American Economic Culture: The Intensification of Economic Life and a Parallel Process of Puritanization.” In New Migrants in the Marketplace: Boston’s Ethnic Entrepreneurs, edited by Marilyn Halter, 97–119. Amherst: University of Massachusetts, 1995. Meyer, Gerald. “Theorizing Italian American History: The Search for an Historiographical Paradigm.” In The Status of Interpretation in Italian American Studies, edited by Jerome Krase,164–184. Stony Brook, NY: Forum Italicum Publishing, 2011. Moskos, Charles C. “Georgakas on Greek Americans: A Response.” Journal of the Hellenic Diaspora XIV nos. 1&2 (Spring–Summer 1987): 55–62. Moskos, Charles C. Greek Americans: Struggle and Success. 2nd ed. New Brunswick: Transaction Publishers, 1989. Veras, George, dir. The Greek Americans. Veras Communications Inc., 1998. Wilson, James Q. “Foreword,” in The Essential Neoconservative Reader, edited by Mark Gerson, vii–x. Reading, MA: Addison-Wesley Publishing Company, Inc., 1996.